M&M Cookie Pie: Once this pie has cooled, your kids will want to decorate it! This is an easy to make dish that is perfect for any occasion, so be sure to save this recipe past Valentine’s Day. See how to make it on Celebrating Sweets here. Rolo Pretzel Bites: Fill a bag with these for a gift or put in a candy bowl at a party, either way, they’ll be a new favorite. What’s best is these only make about 5 minutes to make! See how to make them on A Latte Food here. M&M Cupcakes: Who doesn’t love cupcakes? This cupcake recipe adds as much or as little M&M’s as you’d like. Plus, you can customize the color of the batter and icing to make a fun, festive treat. See how to make these on The First Year Blog here. M&M Fudge: This is a classic Christmas treat, but with a bag of Valentine’s M&M’s, you can easily make it for any holiday you’d like. This is a great treat for the office or for your child’s teachers. We guarantee they’ll love it! See how it’s made by visiting Kitchen Fun with My 3 Sons here. Grab your bag of M&M’s in bulk from BlairCandy.com for all of your Valentine’s treats today! We can’t wait to see what you make this Valentine’s Day, so be sure to tag pictures of your desserts on social media! Conversation hearts are the staple Valentine’s candy. With a unique, homemade card, attach a box of these candies and you’re set! This is especially a great gifts for kids to give to teachers or to their classmates. Whirley Pop Lollipops are the epitome of the classic lollipop. Combine a few flavors and wrap up with a big bow to create a cool, lollipop bouquet! You can also attach sticks to other candies and make a larger bouquet with more candy options. If you’re feeling really crafty, decorate a mason jar and fill with a mixture of M&M’s. Your recipient will love visiting the jar for a quick treat! Plus, they’ll get to reuse the jar every Valentine’s Day! You can also top off every jar with a beautiful bow and a note for a personal touch. There’s plenty of things you can do with Valentine’s candy in bulk! 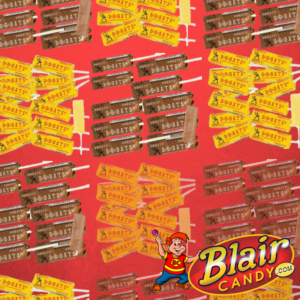 Visit us at BlairCandy.com for inspiration today and get crafting! Whirley Pop Lollipops: What do you think of when you picture a lollipop? If you said big, colorful, and swirly round lollipop, then you’ll love a Whirley Pop Lollipop. Each box has 24 lollipops that are large and colorful. Choose your favorite Valentine’s color and start passing out to your students. Hershey’s Kisses: What child doesn’t love chocolate? If you are assembling goodie bags for your students, these Hershey’s Kisses are a much needed addition. The foil on these kisses is in Valentine’s colors, making them a festive touch to any goodie bag. 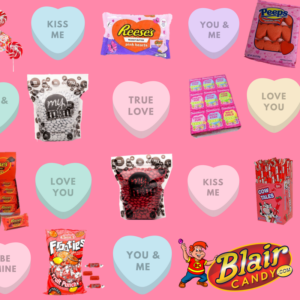 There’s plenty of other bulk Valentine’s Candy for you to choose from at BlairCandy.com! Find Valentine’s treats that your whole class will love and order today to ensure it arrives in time for Valentine’s Day. How Much Do You Know About Dubble Bubble Gum? It all started in 1928. Accountant Walter Diemer says he stumbled upon the recipe, beginning with the – sweet bubble gum flavor and that recognizable shade of pink. Each pack had comic book strips featuring characters Dub and Bub. However, Bub was replaced by Pud in the 1950s. In addition to Tootsie Rolls, Dubble Bubble gum was distributed as rations during WWII. It’s grown to add more flavors! You can now get America’s favorite gum in flavors such as pink lemonade, blue raspberry, apple, sour cherry, watermelon, and grape in addition to the classic flavor. Can’t get enough Dubble Bubble Gum? 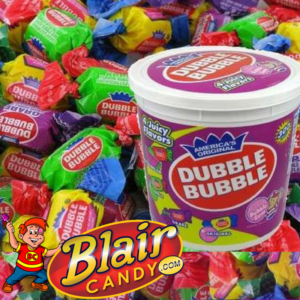 Visit us at BlairCandy.com for all of your retro candy and bulk bubble gum needs. 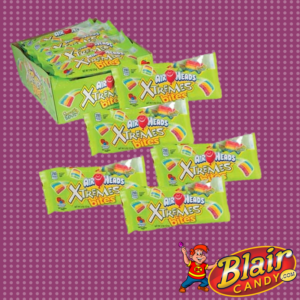 We have the classic gum packages along with the crazy new flavors you’ve always wanted to try! How do you show your sweetheart you love them? If it’s through baked goods, we have you covered! 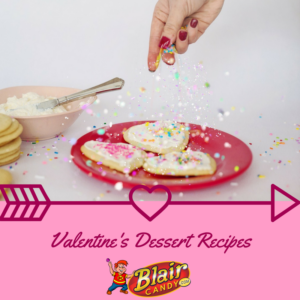 After checking out this recipe, visit us at BlairCandy.com to stock up on all of the bulk Valentine’s candy you need for these desserts and to surprise those you love with something sweet. After making one of these truffles, you can decorate it any way you like! Also, if you love Oreo cookies, you have to make this recipe. See how to make these Oreo Truffle Valentine’s Hearts on the Oh My Goodness Chocolate Desserts blog here. You’ve heard of red velvet, but how about pink velvet? With some cream cheese frosting, these cupcakes will make a decadent and festive treat. Check out the recipe on the Baked by Rachel blog here. Cookie bars are an absolute must for a classroom or child’s Valentine’s party. All you need are M&M’s and you’re set. Brush up on how to make cookie bars on the Number-2-Pencil blog here. If you really want to change things up, try making this adorable pink velvet roll cake for Valentine’s Day. Learn how to make it on Tablespoon.com here. Which recipe will you make first? 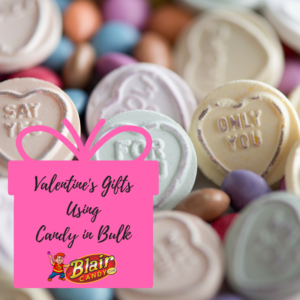 Go to BlairCandy.com today to get all of the bulk Valentine’s Candy you need today and be sure to tag us on social media with your Valentine’s Day desserts! 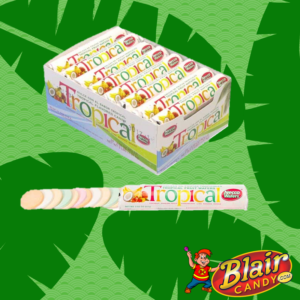 NECCO Tropical Wafers (pictured): Take a trip with these new tropical NECCO Wafer flavors! Each roll has coconut, orange, mango, passion fruit, strawberry, lime, and banana flavors. Brach’s Jelly Bean Nougats: Can’t wait for the Easter Bunny to bring you jelly beans? These nougat pieces have you covered with jelly beans in every bite. Gummy Green Frogs: Any gummy candy lover will hop with delight when you get them this bag of gummy frogs. Each bag has 4 pounds of frogs, so no one will miss out on the fun! Magic Color Bubble Gum Crayons: This isn’t your typical box of crayons. Each box has ten bubble gum sticks in fruit flavors. As an added bonus, each box has a fun sticker! 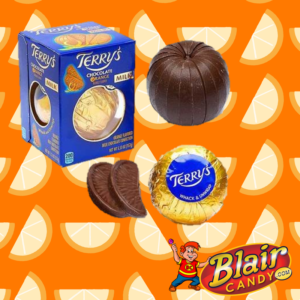 There’s plenty of other new treats at BlairCandy.com! See these candy in bulk treats and other snacks today and start 2018 off on a sweet note. BB Bats: (pictured) Remember this taffy treat? We have bulk bags of banana and chocolate BB Bats for you to enjoy! How does 23 pounds of BB Bats per bag sound? Jell Rings: Tangy orange jelly covered in rich chocolate makes a decadent treat! Each box has 5 pounds of these delicious rings. Idaho Spud: Chocolate, coconut, and marshmallow are combined to make this sweet spud. Get 18 individually wrapped bars in this box. Goo Goo Cluster: What makes up a Goo Goo Cluster? Milk chocolate, peanuts, caramel, and marshmallow make up each delicious cluster. If you have to have these, there are 12 individually wrapped per box. 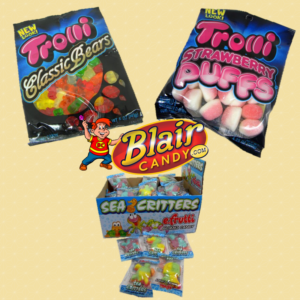 See these and all of our retro candy options by visiting us at BlairCandy.com!